I think kung pao chicken, in all its variations is fantastic. Whether I’ve searched high-and-low for the most authentic Sichuan restaurants in Chinatown or just passing through the abominable neon-lit food court at the mall – it’s all great! Kung pao chicken has certainly seen many incarnations. This particular version was born out my husbands request to make my Chicken Lettuce Wraps, a dish I used to make all the time when we first started dating. It’s true, despite loving those little bundles, I hadn’t made them in quite some time. Except this time I wanted to spice things up… so to speak. Kung Pao Chicken Lettuce Wraps almost immediately came to mind. Plus, the crispy lettuce adds such a nice fresh element to the dish. One of the most notable ingredients in kung pao chicken, are the Sichuan peppercorns. A bit of a misnomer, Sichuan peppercorns are not peppercorns at all. In fact, they are the husk of a dried berry from a small citrus tree called a prickly ash. And… while Sichuan peppercorns are often thought to contribute that iconic heat associated with Sichuan cuisine, they actually contribute very little on that spectrum. It may sound a little bizarre, but when used in the right proportions, it’s actually a very pleasant experience. It’s even said that the numbing qualities of the peppercorns allow the diner to enjoy the more subtle flavors of the chili peppers. In fact, Sichuan peppercorns enhance the salty, sweet, sour, and smoky symphony of flavors going on in this dish. So go on… grab some Sichuan peppercorns. You’re mouth will literally buzz with delight! 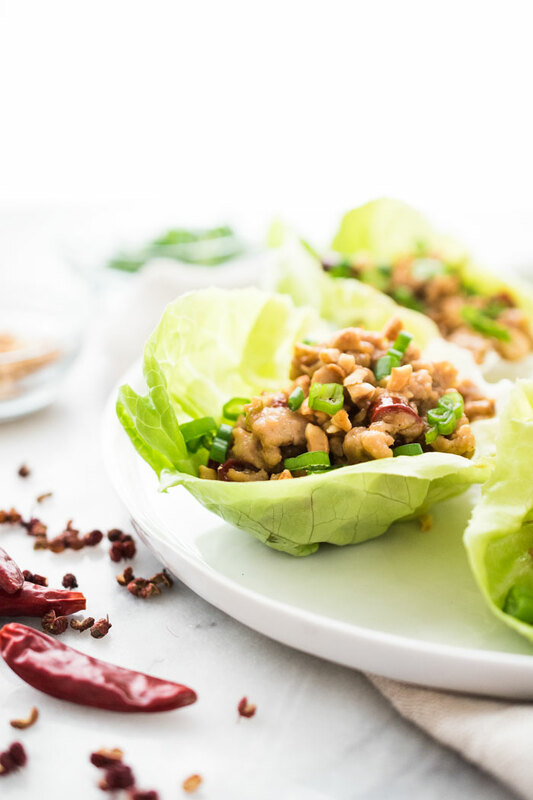 Your mouth will tingle with delight when you bite into one of these Kung Pao Chicken Lettuce Wraps! 4 scallions, white parts thinly sliced. Then thinly slice the green parts of two of the 4 scallions. In a mixing bowl, combine the ground chicken, dry sherry, cornstarch, and salt. Mix well and allow to sit for 10 minutes. In the meantime, add the chopped peanuts to a skillet over medium heat. Toast until lightly browned (this will only take a few minutes, so don’t walk away). Then combine all of the ingredients for the stir-fry sauce and set aside. In a wok or large skillet, heat 1 tablespoon of oil over medium-high heat. Add the marinated ground chicken and sauté for about 3 - 4 minutes. (You’re really just searing the outside, not cooking all the way through at this point - so it's ok if it's a little pink for now). Then transfer the chicken, and any brown bits from the pan to a bowl and set aside. Reheat the pan over medium heat and add 3 tablespoon of oil. Add the peppercorns and once they start to sizzle, cook for 2 minutes longer, until fragrant. Remove the peppercorns with a slotted spoon and discard. Turn the heat down to low and add the chili peppers to the Sichuan peppercorn infused oil. Cook until they darken, less than 1 minute. Add the scallions, garlic, and ginger and sauté until fragrant, about 1-2 minutes. Add the chicken and turn up the heat to high. Give a stir of the stir-fry sauce (incase the cornstarch has settled) and add that to the pan as well. Stir-fry for several minutes, until the chicken is cooked through and the sauce has thickened. 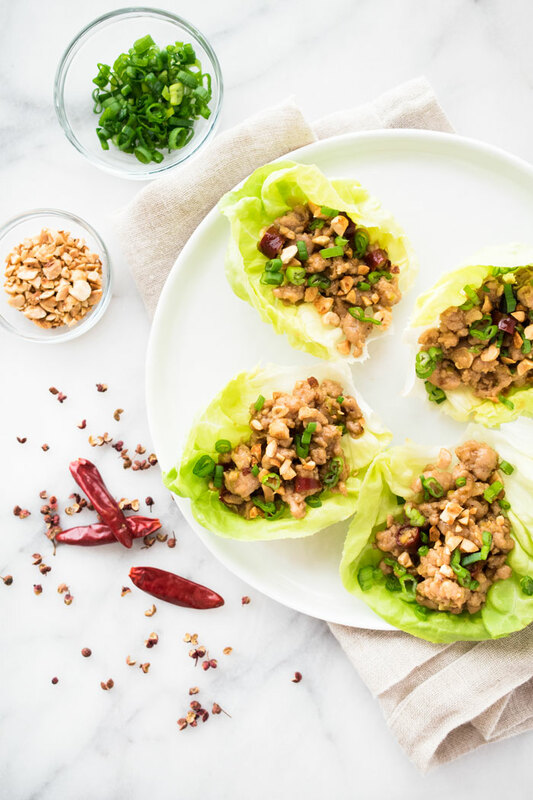 Spoon the Kung Pao chicken into the lettuce cups and garnish with the toasted peanuts and sliced scallions. Serve and enjoy! * Use 1 teaspoon of Sichuan peppercorns for a very mild numbing sensation. Use 2 teaspoons for a little extra oomph. Unfortunately there's no really good substitute for Sichuan peppercorns, so just omit them if you can't find them and/or don't want to order them online, I recommend Penzeys. * Dried red chili peppers are generally sold as 'dried red chili peppers' and not specifically labeled. Depending on the type of chili you buy and its age, the heat can vary greatly. To gage it's level, you'll want to smell the chilies when you open the bag. If it's pungent and tickles your nose, they're probably pretty hot. If you don't get much fragrance off of them, they're probably more on the mild side. If I've learned anything from cooking with chilies, it's that someone's idea of what is hot, covers the spectrum. So use the amount of chili peppers that best fits your comfort level. * Another note about the dried chilies - when cut into small pieces, I enjoy the extra bit of heat of biting into them. If you want the flavor but not the additional heat, then slice the chilies lengthwise (so they're in larger pieces), remove the seeds and cook as directed. When done cooking, simply remove them and serve. * Serves 2 as an entrée and 4 as an appetizer. What a great idea! These lettuce wraps look scrumptious! This looks amazing, Kathleen! I always love the twists you give to classics….they always look so drool-worthy. I am totally craving one of these lettuce wraps now! And very cool to read about the peppercorns..I had no idea! Im a big fan of Sichuan peppercorns (not peppercorns 🙂 ) AND I’m all for my mouth buzzing with delight! 😉 That made me think of being a kid and putting my tongue on a 9-volt battery for that weird little buzz. Did you ever do that? I digress. I’m with you, I’ll take Kung Pao Chicken any way I can get it, especially in cool crisp lettuce wraps! 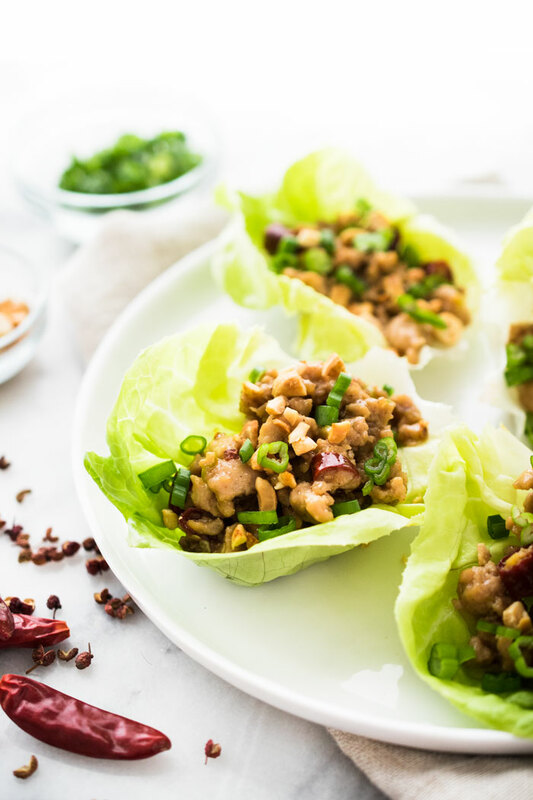 These lettuce wraps look so delicious and awesome! I don’t have szechuan peppercorns, but that’s not going to stop me from making these! They add a nice touch, but the lettuce wraps are still delicious without them! 🙂 Thanks, Jasline! Lettuce wraps are something hubby & I eat regularly. Love the twist with the kung pao chicken. Great way to mix things up. YUM! I’m totally with you! I think I burned off my tastebuds long ago (I have to keep reminding myself that when I cook for others) 😛 Bring on the Sichuan peppercorns and pile on the heat baby! I learned something today that I didn’t know about Sichuan peppercorns. Thanks for the lesson, Kathleen. These lettuce wraps are amazing!! I really need to make these because they will be a huge hit at my house. Judging by the ingredients list, though, I’d love it as much as you do! Loved your explanation about the peppercorns, too. You explained the sensation of legs going numb just perfectly! What?! Oh, Helen! If we lived even on the same continent, I would be driving to your house with a big ol’ bowl!